Somehow, Glastonbury Festival has become a British institution. The hippy gathering here on Worthy Farm in Somerset in 1970 that grew into a festival of performance, politics and music through the 1980s is now as firm a fixture on the summer calendar as Wimbledon or the Oxford boat race. But it could be that mainstream acceptance is simply because of the weather factoran obsession in these parts. This event exposes almost 180,000 members of the public (most of whom camp out in portable tents) to the vagaries of the English elements for at least three days and nights while the BBC broadcasts their weather-coping trials, and the newspapers carry the muddy scenes to the smugly dry-at-home nation. 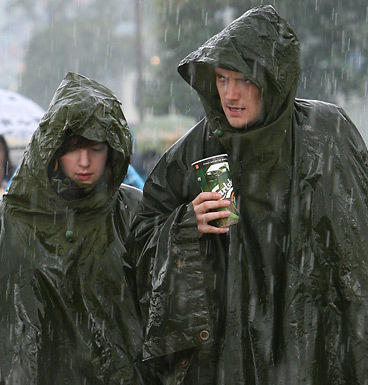 Many of those lucky enough to get a $290 ticket have been here since Wednesday and by Friday morning, when the entertainment lineup really kicked off, the famous Glastonbury rain had indeed arrived in force, soaking attendees and rendering much of the grounds a thick carpet of mud. But there is never any doubt why so many people would endure such misery: It's for the music.